When everybody has freedom, nobody has freedom. 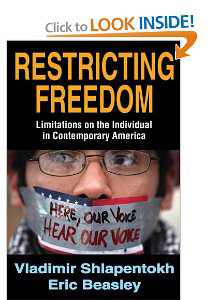 The above thought, long held by this reviewer, is evident in the new Transaction Publishers release, "Restricting Freedoms;" with the subtitle, "Limitations on the Individual in Contemporary America." The authors, Vladimir Shlapentokh and Eric Beasley, are both well learned men, coming from two cultures, who examine the encroaching loss-of-freedom in America and what it means for the future. Within that, a vital, although subtle question is suggested: When do restrictions become the overture for tyranny and dictatorship? The formation of Bolshevik Russia, Nazi Germany and Putin's Russia is mostly a process of the expansion of restrictions on human activity. In the preface of the work, the authors state: "While some Americans undoubtedly benefit from specific rules and regulations, others end up suffering from such restrictions." They go on to state: "The idea that American society should be based on people enjoying UNADULTERATED freedom in ALL spheres of life is unrealistic and simplistic" (emphasis mine). The world still looks to America as the ultimate symbol of freedom, which is why millions of people still pour in from all over the world wanting to live and work here with the liberty to pursue whatever career they choose. America is the only country founded upon God's biblical principles, with freedom rather than a monarchy or dictatorship. (Atheists-HUSH! Have coffee with me and I will show you the founding documents.) This is the unique quality that made America powerful from the beginning. That freedom is rapidly evaporating, bringing us to the point that the government can dictate that you purchase their healthcare package (so they will be in total control of your health issues) or be fined heavily. Choice of association has become 'null and void.' Free speech is no longer free with ever growing restrictions. The founding fathers would be horrified to observe how one can be ruined in business or even jailed for having a negative reaction to something disgusting, or speaking an opinion or observation that is not, politically correct, a term, by the way, that was coined by Adolf Hitler. Restricting Freedoms is the first book this reviewer has seen that gives a case history of these restrictions which has skillfully transformed our freedoms and biblical principles into socialism and communism. America has been conned into relinquishing those very freedoms that made this country great. 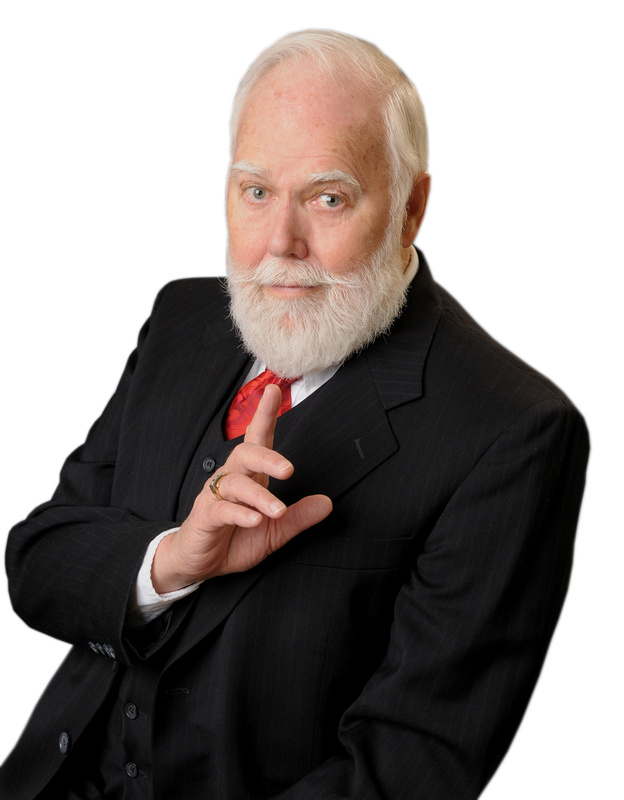 So how did traditional norms and rules regarding marriage, family, faith, sexuality, birth and death decisions, parental authority, education, our history and morality itself become hijacked, then diluted and manipulated to a point that now it is all declared illegal, while vulgarity, cultural insults, ethical lapses, adultery and deviation have become legal? However, we still have. "Freedom of Choice" – to kill an inconvenient unborn baby for one, along with total freedom to satisfy all urges of "human nature" without constraint no matter who it hurts. "Whatever is right for you is right," teaches the universities. What is more, those who speak out against these changes can face charges in court, which has officially ended "freedom of speech," one of the premier principles America was founded upon. This scholarly work is well researched and written as it maneuvers through the lopsided laws of restriction with the various groups affected. There is a huge bibliography, and for philosophical students and buffs, there are many quotations of interest. Transaction Publishers is a haven for readers and educators seeking scholarly analysis by experts in the various fields of interest. QUESTION – Why did the authors of this fine work sabotage it? It should be known that any and all books sent in for review will be READ, not skimmed through, so it is wise to not attempt to slip something in. I was prepared to give this book full endorsement and thumbs up until I got to page 67 which is the first page of Chapter 5 in a section titled:Country over God: Limitations on Religious Freedom in the Contemporary United States. So-called Founding Fathers? They WERE the Founding Fathers, not, "so-called," a term that is always written with a sneer.Why was that necessary in an otherwise excellent research? Why was it necessary to try and slip that in? It wasn't. Then this follows on the next page: "This chapter will spotlight the limitations of religious freedom, as well as the JUSTIFICATION for their necessity." Even though we spotted some existentialism persuasion in the text, this went even further on page 132, stating that we are able "to speak freely without threat of governmental retaliation (e.g.McCarthyism and the House Un-American Activities Committee, and, more recently, the Patriot Act"). Why would the authors seem to object to an investigation of the House Un-American Activities Committee whose purpose was to thwart encroaching communism in America? This carelessness by the authors, at least for this reader, worked to discredit the entire work, even though on page 123 they used some valid quotes from Romans and Proverbs. Again, this reviewer reads every word. Perhaps others will interpret it differently. Even so, the authors are brilliant researchers with good documentation, who make a solid case of how restrictions, meaning different things to different people, are changing America and how society as a whole will react. It is a worthwhile read for historians.